rich musical past. Carter, who incidentally is eyeing a run for mayor, puchased the state of the art recording studio recently and promptly initiated a complete renovation that will make it our area's premier venue for showcasing local and out of town artists. His idea: create a facility that will showcase our history while providing venues for shows and local rentals. Carter's vision is shared by his wife Kim McAbee, a singer with Buck Owens who has her own musicial career. * … DESERT ROSE BAND: My personal taste in music runs a tad eclectic, and I am not one to pine away for the music of my youth. That said, there is one musician (Chris Hillman) who I will simply not miss when he comes to town. As an original member of the Byrds, the Flying Burrito Brothers, Souther-Hillman-Furay and now the Desert Rose Band, Hillman was a pioneer in the evolution of country rock, one of the first big-time rock musicians to embrace country and bring the pedal steel guitar, mandolin, banjo and fiddle to mainstream rock. 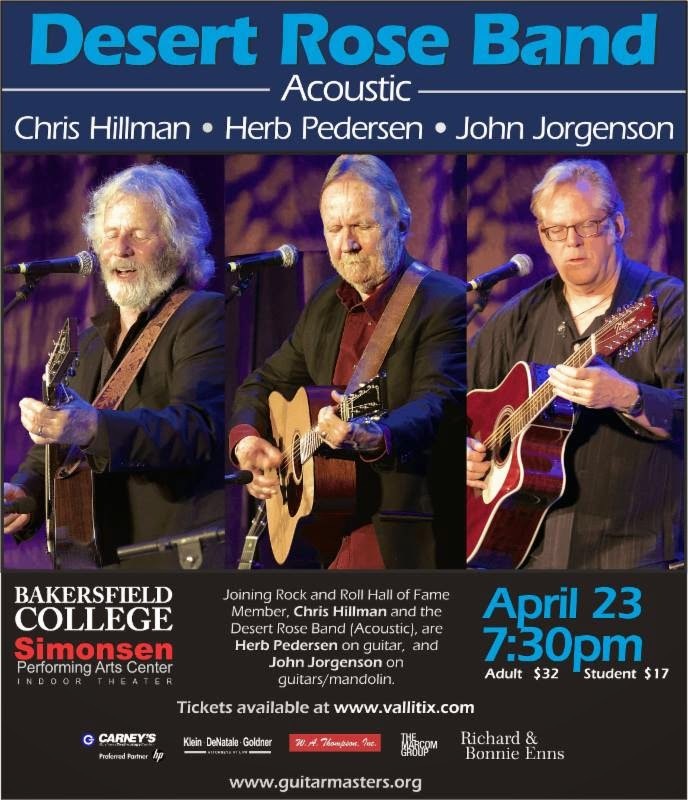 A gifted song writer and vocalist whose melodies will tear at your heart strings, Hillman will bring his band to the newly renovated Bakersfield College indoor theater thanks to Rick Kreiser and his Guitar Masters series. This can't miss acoustic event is this Thursday at 7:30 p.m. Tickets can be purchased at the door for $33 or $18 for students. * … BAKO: Local architect Steve Kieke was in Charlotte, N.C., recenbtly when he spotted a local eatery called Bakersfield East Tacos. "It turns out that it is the newest location of the Bakersfield OTR restaurant in Cincinnati that TBC has reported on previously (can’t recall if it was you or Robert Price. Mayor Hall presented the owners a key to the City in Cincinnati in 2012). They now have five locations; Cincinnati, Columbus, Nashville, Indianapolis and Charlotte. According to the owners, ‘the concept was taken from Bakersfield, Ca., where outlaw country music and Mexican restaurants find a comfortable cohabitation. Bakersfield is a spot where the food is simple, the service is warm and the atmosphere is alive.’ Sounds like us alright. It was even featured in Diners, Drive-ins and Dives last summer; it might have inspired Fieri to come here!.. It’s great to see Bakersfield mentioned in a positive light as opposed to all of those nasty ‘quality of life’ lists we always end up on the wrong end of." * … SPOTTED: On a friend's social media post: "Just saw a girl driving a pink Smart Car with a Disney Princess license plate. A moment of silence for whatever poor guy ends up dating her." * … FOODIE: One of my favorite Bakersfield steak houses is KC Steakhouse, an understated eatery with a lot of history and color. This week it is offering some killer deals with coupons in The Californian, including a "buy one and get one free" offer for both lunch and dinner. Check it out.